Distribution and habitat: Anubias barteri is a flowering plant that hails from the west of Africa. In the wild, it can be found growing in streams, rivers and marshes. It is often found growing on large stones or logs (rarely in the substrate) immersed, semi immersed or (rarely) totally submersed. 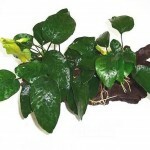 Description: Anubias barteri is a flowering plant that has lush green arrow shaped foliage. This rosette plant may reach up to 40cm (16 inch) in width and has thick, creeping rhizomes. The leaves are thick, dark green and quite tough, with a leather-like appearance. Diagonal lines run from the center vein to the outer edge of the oval or arrow shaped leaves, depending of plant size and variety. The underside of the leaf is a lighter green than the top and the veins are clearly visible. Almost indestructible, individual leaves can last for years. 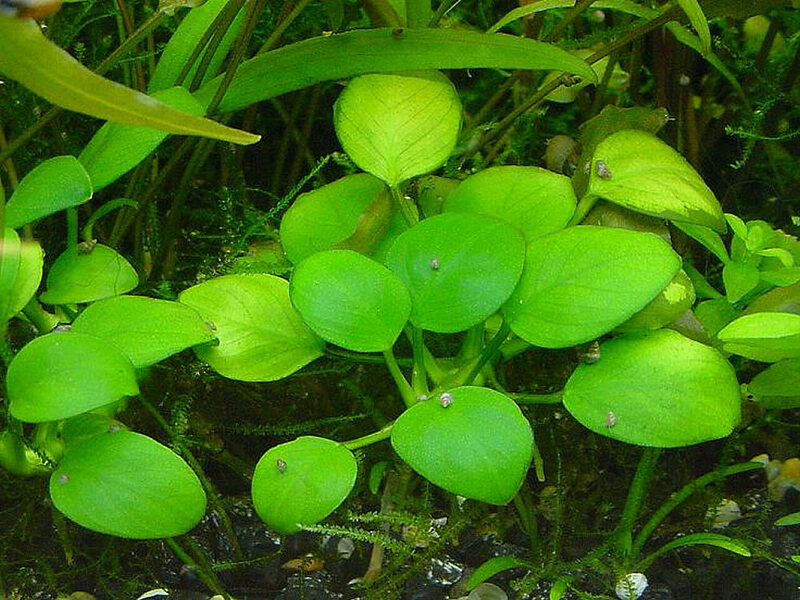 The Anubias barteri is an amphibious plant that will survive either totally or partially submersed underwater. In its emerged form, its leaves tend to be larger and its growth faster. 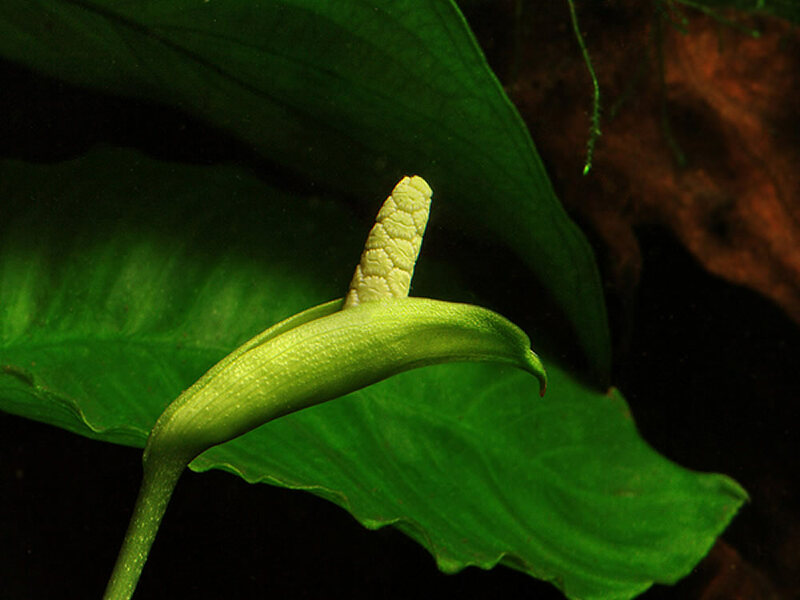 Occasionally this plant will flower, either when fully submerged or when partially above the water line when is used in a paludarium. 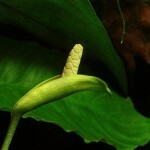 The flower is in the form of a creamy white spadix, similar to a cala lily. The flowers will last a long time, often several months. In sumerged condition, its flowers will also produce seeds. Seems that blooming occurs more often in submerged setups. 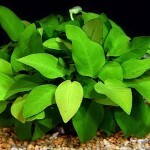 Care: Anubias barteri is a hardy plant that has lush green arrow shaped foliage. It is highly tolerant to a variety of growing conditions, including poor conditions, making it easy and ideal for beginners. In order to keep these plants small, simply trim back the leaves near the rhizome with a sharp pair of scissors. 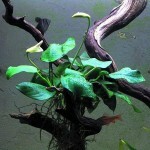 Under correct water conditions, the Anubias barteri propagates by side shoots on the rhizome, causing rhizome division. The rhizome stores food for the plant, which is one of the reasons this plant is so easy to care for. Even if it should lose all its leaves, the rhizome will slowly begin to sprout new leaves. Prune dead or damaged leaves back to the rhizome to keep the plant healthy. To encourage the growth of new leaves, make small cuts in the skin of the rhizome. New shoots will emerge from the cuts. They are very slow-growing however, taking several years to reach their full size. Contrary to what was thought for years, this plant does respond to the use of CO2 and additional lighting, growing at a faster rate than without. Water: Anubias barteri will grow successfully in soft and acid water conditions. The ideal water conditions for best results in gowing Anubias barteri are an alkalinity of 3 to 7dKH and a pH of 6.5 to 7.5, but it is extremely tolerant when it comes to pH and can adapt to a pH-value from 5.5 to 9.0. Water flow over the leaves is an encouragement for best growth. Because of its robustness and its very good adaptation to a wide range of water conditions, Anubias Barteri can be kept in most tanks. Due to their bold leaf shapes and forms, Anubias barteri work best as single specimen plants in the tank. They look stunning planted next to an interesting piece of driftwood, especially if lit with a spotlight. Anubias barteri plants make a welcome addition to any outdoor planted pond because the leaves are not very tasty to plant-eating fish and they tolerate almost any pH as long as water temperature is above 20°C (68°F). They typically grow in running water, but Anubias barteri plants can also grow in standing water. They grow well in freshwater ponds with plenty of shade at ideal water depth of 30cm (12 inch). 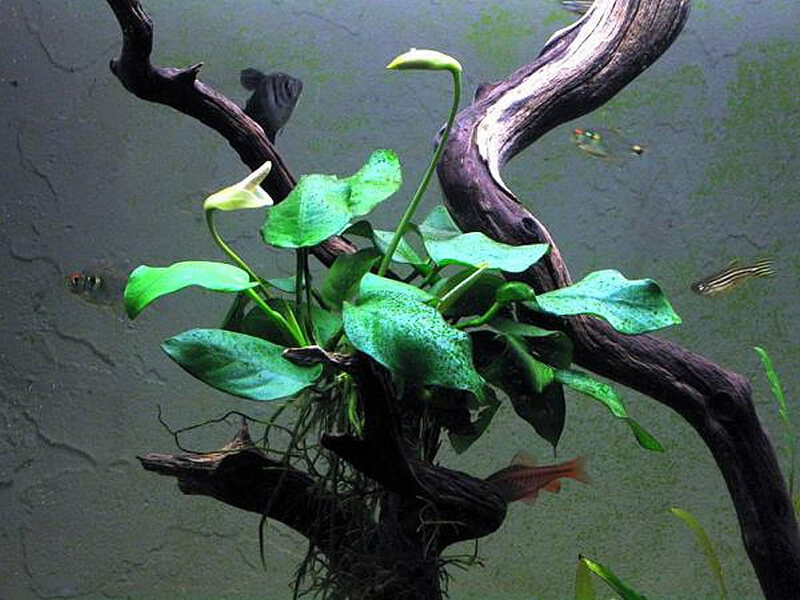 Substrate: Anubias barteri plant attaches itself to rocks, driftwood, substrate and may even float. It can also be found rooted in gravel and other substrates. When planting Anubias barteri in aquarium, special care should be taken of the rhizome and the roots. The rhizome should not be buried beneath the substrate, as it will rot and die off. In small grains the roots might not be able to get a good hold and the sand tends to compact, while larger gravel has a tendency to collect pockets of rotting detritus. The ideal size is 2-3mm gravel or 1-2mm coarse sand. The bottom 1/3 of the gravel can be supplemented with a fertilizer, of which popular choices are peat (softens water), laterite (a clay containing iron, usually used with undergravel heating systems) and soil. 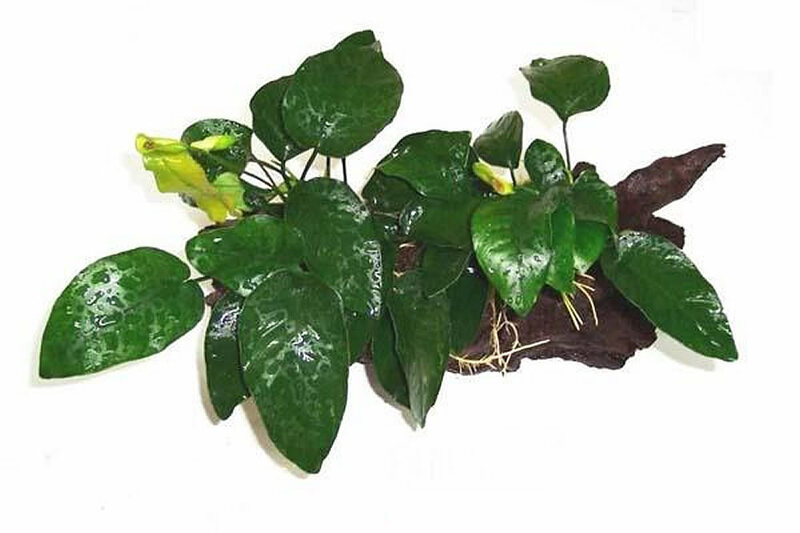 A good technique to attach Anubias barteri to pieces of wood or rocks is to tie down its roots against the chosen substrate. Use cotton thread or light fishing line when attaching Anubias barteri plants to rocks or bogwood and tie it loosely to avoid damaging the plant. The plant will creep horizontally in a single direction, growing quite slowly. After a while its roots will anchor themselves to the substrate and the fishing line could be removed. 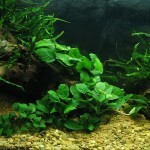 – Anubias barteri plant prefers a rich substrate, but can also tolerate plain gravel. If there is substrate or gravel on the bottom of the pond, the roots will grow into it. Keep the rhizome above any substrate or gravel. The rhizome needs to be in the light for the plant to grow properly and may rot if buried. This technique is best suitable for tropical areas where these plants can be planted permanently. – If the bottom of the pond is bare, tie the plant to a rock or piece of driftwood to anchor it in place until the root system develops. The roots will grow around the rock or driftwood. Once this happens, remove the string.Otherwise, it may simply be stuck between rocks. – Anubias barteri may also be able to grow by floating freely in the water. Light: Anubias barteri plant prefers moderate lighting, approximately 2 to 3 watts per 4liters (1 gallon) of water provided by a fluorescent fixture with daylight bulbs. The light should be consistently on 10-14 hours a day. If placed under high lighting conditions the leaves will grow faster, but will be more compact and susceptible to algae growth, particularly beard algae. The algae does not hurt the plant, but it does affect its appearance. However, care must be taken when using high lighting conditions, as the additional light can promote algae growth on the leaves, which is hard to combat. In these situations, keeping algae eating fish will help in dealing with algae growth. Another way to keep them away from algae and control algae growth on their leaves is to introduce them in the tank after other fast growing plants have been introduced. Fast growing plants will regulate and control algae outbreaks before introducing slower growing plants. Under high lighting conditions, this plant seems to create more leaves but smaller in size. In the aquarium Anubias barteri should be placed in shaded areas to reduce the risk of algae developing on the leaves. Anubias barteri is best in the midground or background areas of the aquarium due to its robust size. As the name of this species suggest, Anubias barteri plants like shady locations when grown in outdoor planted ponds. Temperature: Anubias barteri can thrive in a wide range of temperatures from 22 to 27°C (72-82°F). Before placing them in outdoor ponds, check the temperature of the pond water. 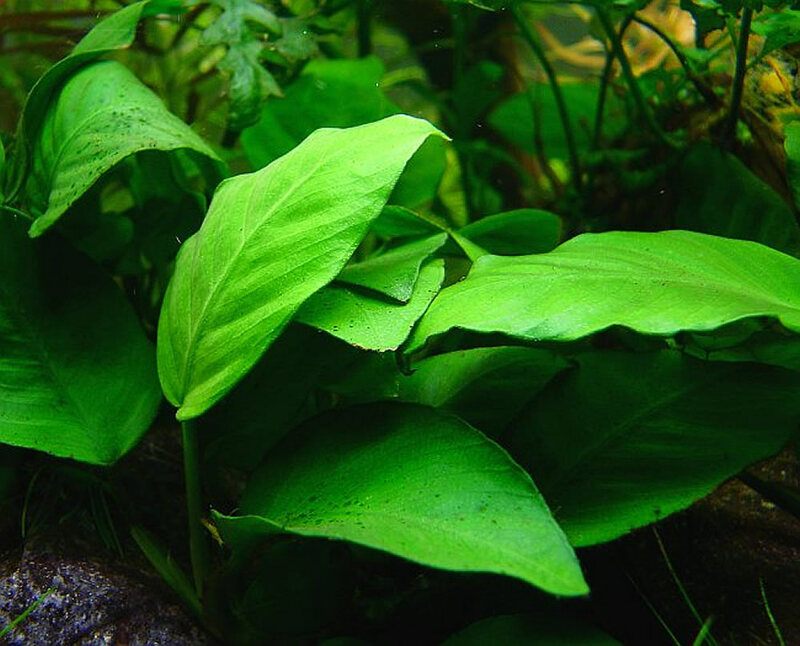 Anubias barteri tolerate most water conditions, but need temperatures between its hardiness – 20 to 30°C (68-86°F). Lower temperatures can lead to yellowing leaves which finally will die back. Place plants in buckets of pond water and set them in an indoor area under plant lights or near a window if temperatures drop to freezing. Feeding: Fertilization is not necessary, nor is the use of CO2, however additional CO2 will promote faster growth. Anubias barteri plants are low demanding when it comes to nutrients and the organic waster produced by the fish is usually enough. They will also do well with the carbon dioxide exhaled by the fish and do not need additional carbon dioxide. High levels of phosphate (1.5-2 mg/l) seem to induce flowering independently of the other parameters in the tank or the health status of the plant. High phosphate levels in combination with a good iron and micronutrient supply reduce problems with spot algae under strong light. A glut of hair algae growing on the leaves of the Anubias barteri can indicate low Co2 levels within the tank. 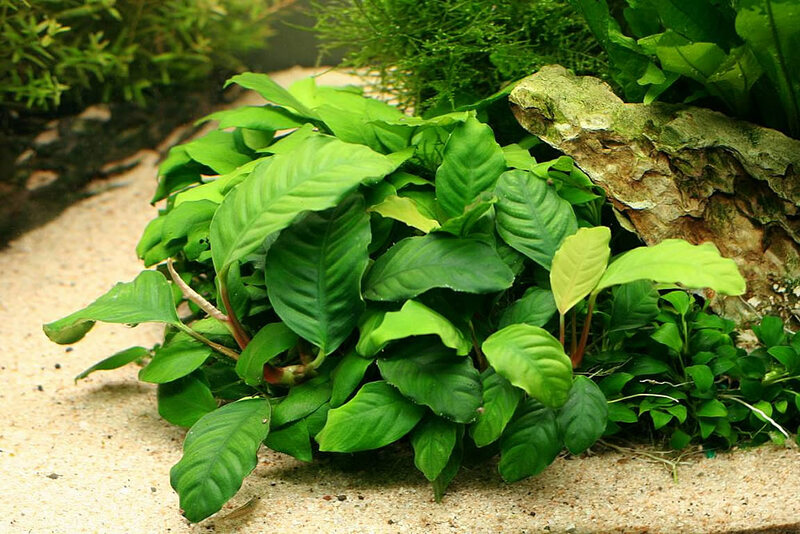 Liquid Plant Food, CO2 Injection, Trace Elements, Substrate and Iron-Rich Fertilizer can be used in tanks with Anubias barteri plants. Propagation: Propagation for Anubias barteri is very simple and straightforward. In many cases the plants themselves will create new growth tips from the rhizome resulting in a full dense cluster of leaves and one large plant. This new growth tips and be cut off or broken free from the original woody stem when several leaves have developed which can provide enough light catching ability to make food for the plant. Several techniques can be employed to speed up reproduction or used just to reduce the size of one large plant. To create new growth tips or to just trim a large plant break off a section of the rhizome that has several healthy leaves on it. The portion of plant that did not have the new growth tip will produce a growth tip, assuming that it has several leaves of its own to begin with. To create a fuller single specimen take a sharp knife or razor blade and nick a small cut into the rhizome of a healthy plant. This will encourage a new growth tip to form. In these ways will form multiple plants to share or a monster show piece plant. 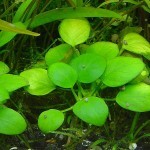 It is also possible to cultivate Anubias from seeds. Only plants that grow out of the water will produce seeds. Note: Anubias barteri is not a true submerged plant, therefore it is not a true aquarium plant, being most suitable plant for paludarium. 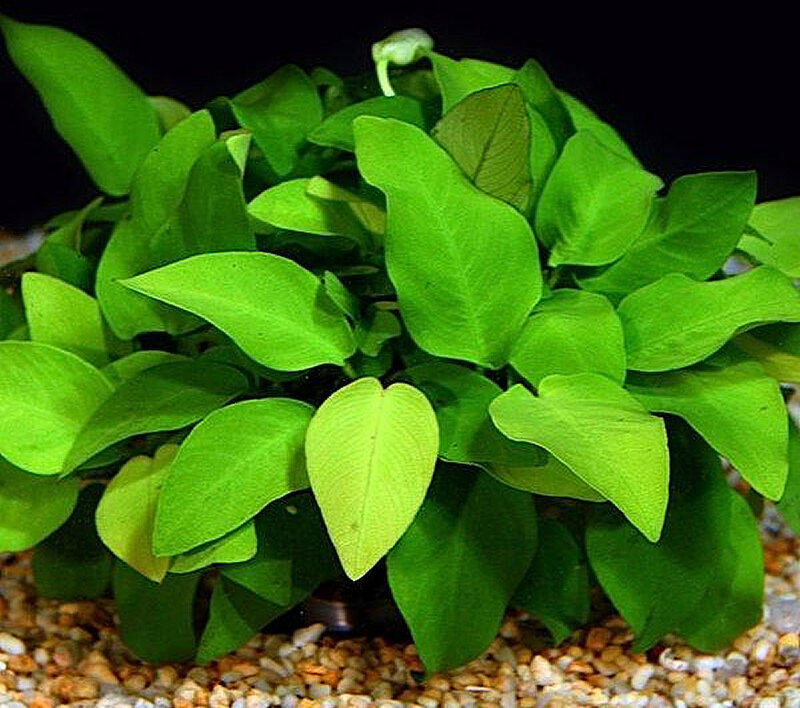 Because the plant is not hurt if kept totally submerged, these plant is a popular plant in aquarium-scaping. Underwater its development is slower. Anubias barteri var. 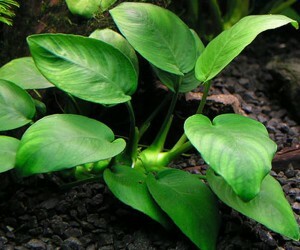 nana is one of the most widely spread aquarium plants in Europe, Asia and the US. In nature Anubias species are found in wet, forested areas, generally along the banks of waterways. These shady locations gave rise to the name given to this genus, which has been named after the god of the afterlife, Anubis. Today, Anubias are cultivated across the world, for use in aquariums and paludariums. Anubias barteri var. angustifolia (Synonymous: Anubias lanceolata f. angustifolia) is a long-stemmed plant with dark green, long, narrow and pointed leaves. The leave blades are 5-9 times as long as wide and the petioles are 0.5-1 times as long as the blade. It can reach a height of 30cm (12 inch) and has long lasting leaves (usually they will last several years), but is a slow grower – only 6 to 10 new leaves per year. This plant suits big tanks because of its size. This plant is also known under the name Anubias barteri var. afzelii. Anubias barteri var. caladiifolia (Heart-Shaped Anubias) is one of the bigger kinds of Anubias Barteri. Growing as big as 12 inches, its heart-shaped leaves can be as long as 23cm (9 inch) and 13cm (5 inch) wide. Because of its size, it is recommended to plant it in a large tank or pond. This plant can be of the best effect if planted in group in the middle to back side of the tank. Anubias barteri var. coffeefolia has is a deeper green, with dark ribbing on the leaves with textured, ribbed-leaf appearance. Also, as new leaves form on this plant the stems appear red and sometimes the new leaves are more yellowish in color, darkening as they mature. It is a relatively short plant that grows to a height of 15cm (6 inch), but is known to grow very wide. Anubias barteri var. coffeefolia is most suited in the midground area where it can form hedges and spread along driftwood. Although these plants have been traded under the name Anubias barteri var. coffeefolia, this name has no taxonomic status, being just a variation of the Anubias barteri. Anubias barteri var. glabra (Synonymous: Anubias lanceolata, Anubias minima) are large, narrow-leafed Anubias barteri with leaf-stem up to 35cm (14 inch) long. The leaves are spear-shaped, up to 21cm (8 inch) long, 9cm (3.5 inch) wide. This plant will reach 30 to 50cm (12-20 inch) in height in aquarium, therefore it is suitable for large tanks in back position. Also suitable for ponds in warm environments. The usual growth rate is 4-8 leaves per year. Anubias barteri var. nana (Anubias Nana, Dwarf Anubias, Nana) is a dwarf variety, only 5 to 15cm (2-6 inch) tall. This variety is even slower grower than Anubias barteri, often only producing one leaf in a months’ time. The leaves can reach a length of 3cm (1 inch) and be 2cm (0.8 inch) wide. Anubias barteri var. nana has charming heart-shaped leaves and a creeping growth fashion. Because of its reduced size, it is best to be placed in a front position in the aquarium. Anubias barteria var. 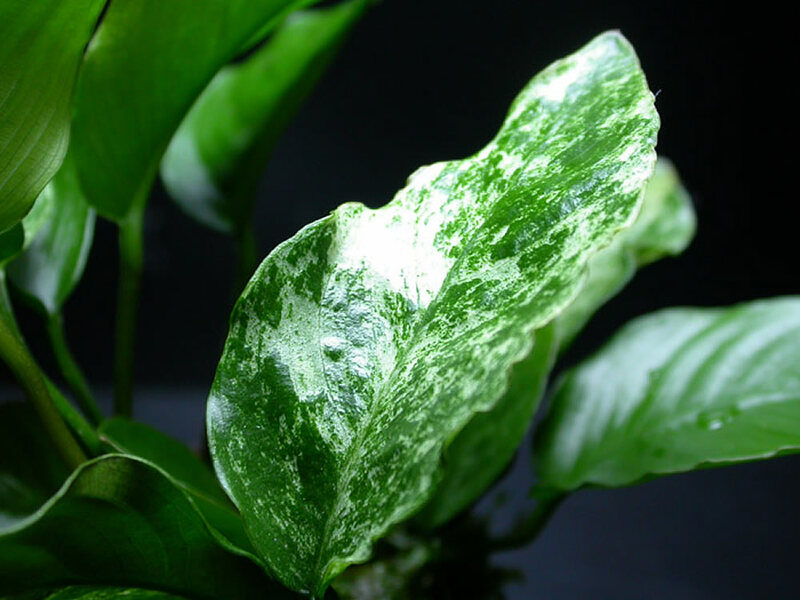 nana ‘marbled’ is variegated, with most of the leaf white and some speckling of green. It is a variation of Anubias barteri var. nana. Anubias barteri var. nana ‘gold’ is again a color variation of the common Anubias barteri var. nana. Its leaves have a yellow green colour. This colour could be misconstrued as simply sick, but it is a true color variation. 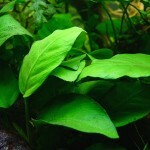 Lifespan: Anubias barteri are very robust plants and live for numerous years. 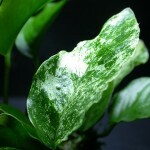 Availability: Anubias barteri is the most commonly available species of this genus. 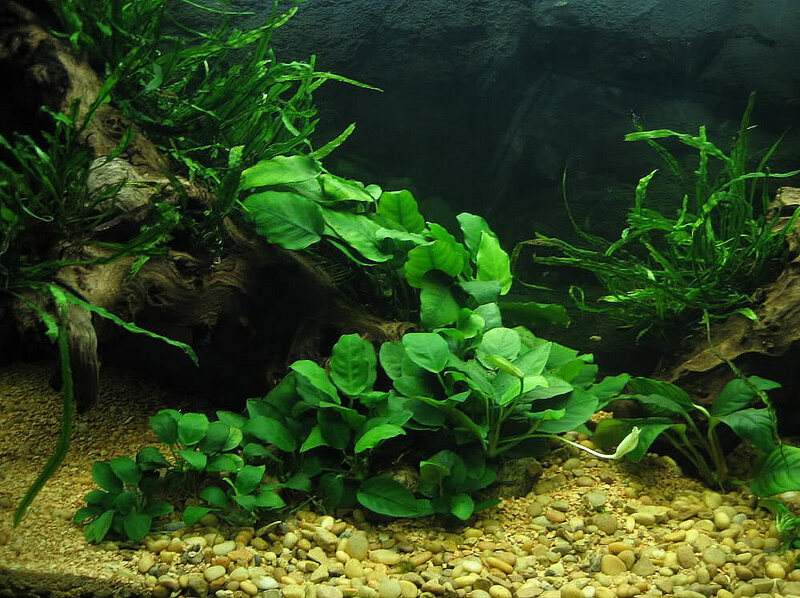 Uses and display: Anubias barteri are commonly used in aquariums, usually attached to rocks or bogwood. They live equally happily fully submerged or partially submerged. These plants are so attractive that they are often used as a centerpiece. They can be used as a mid-ground plant or foreground plant and are often attached to driftwood or rocks. They will not only add beauty, but also improve the water quality and add color to the aquarium. 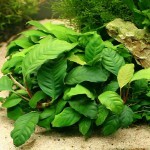 It is an extremely hardy plant, which makes it popular for aquarium use, as well as in paludariums. Because of its tick and tough leaves, it makes an ideal plant for aquariums with species of fish that are known to nibble on or uproot plants. Small fish will find this plant makes great a hiding place. And to do something different with them, they also work very well in terrariums. Paludariums are their best option to be grown in.